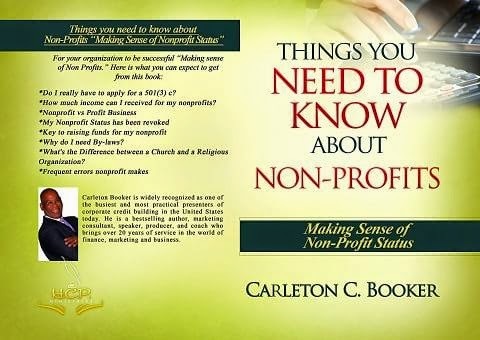 Carleton C. Booker is the author of Things You Need To Know About Non-Profits. A Carleton Booker strategy provides business consulting & business marketing services in Calif. He’s committed to helping small and medium-sized businesses and nonprofits grow and succeed. We’re there when you need to drive revenue, foster growth and build sustainable business results. Carleton is committed to helping your business generate a return on investment that will make your stockholders happy and business owner. This is so important to him that if he’s don’t believe it’s possible, he will tell you straight out, and be specific in explaining our reasoning. Describe Things You Need to Know About Non-Profits in a few sentences. This book is the GPS to guide you the correct path how to start a nonprofit and what it takes to keep it! Anybody who wants to start a nonprofit and current nonprofit that have question on what’s next? What inspired you to write a book that simplifies the process of applying for non-profit status? I meet so many people starting nonprofits, and they always seem to have issues! And the main issue is not understanding that the nonprofit is a business! It still has to function like a business; you just don’t have stockholders Your main function is to serve the community and to raise funds, funds, funds -- did I say funds -- to support the nonprofit so it can function. A lot of people starting non-profits seem to be confused with whether to apply for a 501(3) c. Why do you think there is so much confusion? So churches are automatic exempts under the 501(3)c and it’s not require to file for the exemption, and the IRS doesn’t make it easy to apply. The application asks a lot of questions on the application; if you don’t know how to complete it the application will be delayed. What are frequent mistakes people make when starting a non-profit? A business plan and a fundraising strategy. Many people starting a non-profit seem to hit hurdles with funding early on. What can people do to avoid problems with funding their non-profit? Get help! A (business coach) that will help in areas like fundraising that you have no understanding, getting the right people in the right position . How do you think reading Things You Need to Know About Non-Profits will impact people? I hope it give an insight what it really takes to operate a “business” it’s just don’t take a profit for a one person to profit. The next book is to show business owners to operate your business like a real business from “mom and pop” when it comes to corporate credit. Title: Corporate Credit Makeover. Is there anything else you'd like potential readers to know about Things You Need to Know About Non-Profits? It’s a real easy read to give you foundation if you’re looking to start or currently have a nonprofit. It tells you the down and dirty of the nonprofit business, the “real stuff “that no one tells you, if they do, it's $3,000 to $5,000 to get the information. Instead, you can read the book or contact me to coach you! What happens if my non-profit status has been revoked? What’s the key to raising funds for my non-profit? Why do I need By-laws? A church is any place of worship. A Religious Organization could be a faith base nonprofit that is not a place of worship . How much income can I received for my non-profits? As much as you can raise or incoming donor will give to your organization is the answer. What’s the difference between a non-profit and a for-profit business? Non-profit: no one person owns it; it’s the public. Profit Business: it’s a profit for gain to someone or body of people to bring a profit to everyone that is part of the company.